The Shipra flows into Ujjain at sunset. The Kumbh Mela is a celebration of water. 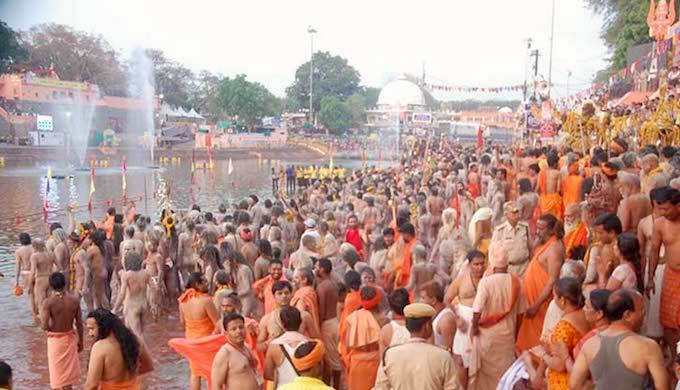 Millions gather at the banks of a river in four ancient places — Ujjain (Shipra), Nashik (Godavari), Allahabad and Haridwar (Ganga) — every 12 years for a dip in the water that carries with the prospect of salvation. This year at Ujjain, as many as 60 million people bathed in the Shipra river during the Mela that ended in May. Despite the festivities, there has been an undertow of anxiety at the Kumbh Mela in recent times, brought home painfully this year when water from the Narmada had to be diverted to the Shipra to maintain flow so that people do not return disappointed from this huge gathering. When the Kumbh Mela was held in Nashik last year, groundwater had to be pumped up to maintain a semblance of flow in the Godavari. Most pilgrims who went to the fair were unaware of the water crisis. Those few who know did not care much. The Mela drew the sadhus in the thousands and the gala Shahi Snaans (royal baths) saw multitudes. People have returned happy. But the rivers are dying and the celebrations will increasingly seem hollow if intelligent efforts are not made to save the rivers. A sadhu plays a captivating tune over the hustle bustle of ritual bathing in the Shipra river. The ghats of the Shipra were fit to bursting during the Kumbh Mela. The Narsingh Ghat in Ujjain sports a fresh mural during the pitcher festival. People coming to cleanse their souls look for shade as summer temperatures soar to record levels. Sadhus at the Ram Ghat for the ritual holy dip. The Shipra becomes a river on steroids, filled with waters of the Narmada. The Omkareshwar dam on the Narmada. Water was carried from here to make the Shipra flow again. The Narmada at Maheshwar downstream of Omkareshwar remains robust even after a lot of water was taken out it. A portion of the 50-km-long concrete pipe carrying Narmada water to the Shipra. The Shipra enters Ujjain as a rejuvenated river. Pilgrims stood in queue for hours to visit the many temples around Ujjain. The crush of pilgrims thronging the bathing ghats remained undiminished throughout the month long Kumbh Mela.